Wolfrathausen, Germany, January 31, 2017 – EIZO today announced the new Raptor RP4325, a 42.5-inch primary control monitor with 4K UHD (3840 x 2160) resolution for primary control positions in air traffic control (ATC) centers. The Raptor RP4325 emphasizes durability and reliability with 24/7 operation. It is built with industrial-grade components, making it better suited to long-term use compared to commercial-grade products. The monitor uses full sheet steel industrial-grade housing for durability in demanding environments. It is also designed to maintain low heat output without a fan to provide noiseless operation while protecting components. 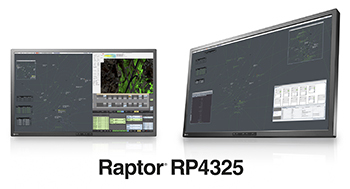 The Raptor RP4325 displays video input from up to three sources simultaneously. Users can freely position each screen for a highly customizable layout. 4K x 2K resolution allows the ATCO (air traffic control officer) to display high-resolution data in full on one screen without the obtrusive bezels typically found in multi-monitor workstations. 2K x 2K and auxiliary information can also be displayed simultaneously on a single screen, allowing controllers to view more information easily in one place for improving situational awareness. The monitor brightness can be adjusted within a wide range of 25 to 500 cd/m2 to suit the installation environment as well as the needs of the ATCO. EIZO’s fully automated brightness stability function uses an internal backlight sensor to stabilize the brightness level throughout the life of the monitor, compensating for fluctuations caused by variations in ambient temperature and the passage of time. The monitor’s design features a sleek cabinet with unobtrusive side bezels that measure just 24 mm so ATCOs can focus more on the screen. The monitor’s depth is also minimized to maintain a weight distribution close to the center of mass and it weighs just 20.5 kg, resulting in less stress on mounting fixtures over time. EIZO offers extensive customization of the Raptor RP4325 so system integrators and ANSPs can optimize the monitor to best suit their needs. Customization includes, but is not limited to, mounting configuration, cabinet color, protection glass, and monitor functionality upgrades. EIZO will be showing the Raptor RP4325 for the first time at World ATM Congress 2017 in Madrid, Spain March 7 – 9, 2017. Visit Booth 349 to see a live demonstration of the product. The Raptor RP4325 is now available. Please contact atc@eizo.com for details.